There are several statements known as "Miquel's Theorem", but the one I'm interested in here is Miquel's Six-Circle Theorem. It states that, if four points \( ABCD \) lie on a circle, and we draw four more circles through \( AB \), \( BC \), \( CD \), and \( AD \), the second intersection points of each of these four circles will also lie on a circle. 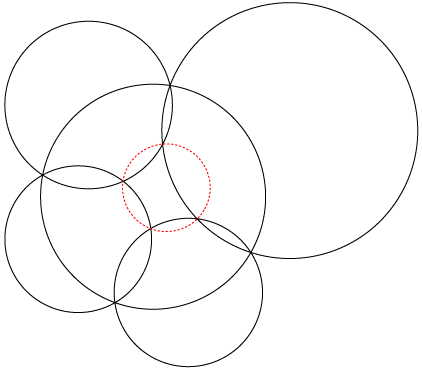 Below I've drawn the first five circles in black, and the circle that must exist through the intersection points in red dashes. Theorem: Let a cuboid be placed in 3d in such a way that seven of its vertices belong to a sphere. Then the eighth vertex also belongs to the same sphere. Proof: By polar projection we can transform statements such as Miquel's from circles in the plane into equivalent statements about circles on a sphere. But a circle on a sphere is just the intersection of the sphere with a plane, and three circles meet at a point when the point where the corresponding three planes meet lies on the sphere. So, if seven cuboid vertices lie on a sphere, then any four of them on the same face can be taken as \( ABCD \); let the other four vertices be correspondingly \( A'B'C'D' \). Miquel's theorem for circles on a sphere tells us that the four points where the lines \( AA' \), \( BB' \), \( CC' \), and \( DD' \) cross the sphere are coplanar. Since three of these crossing points are cuboid vertices belonging to the plane \( A'B'C'D' \), the fourth must be as well. ETA, 1/23/08: Miquel's original paper can be found here, and already mentions the generalization to circles on a sphere, though not to vertices of cuboids. Thanks to Tim Robinson for digging all this up.